In this manual, I highlighted the most basic steps of Hashcat using and detailed the main operating modes of the program. This instruction is designed for absolute beginners. I hope it will reduce the number of ‘children's’ questions. 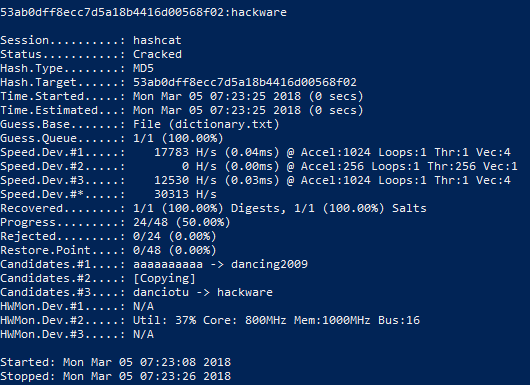 Hashcat is a program for hacking passwords, it's a powerful application with lots of features. However, this is not the easiest to use program, therefore you need to spend time learning it. In this manual, the most typical situations with hashcat are described. We will consider considered as very ‘childish’ questions, like ‘how to run hashcat’, and rather complex, like the correct composition of masks, custom character sets, program options, problem solving and so on. The peculiarity of hashcat is the very high speed of brute-force passwords, which is achieved through the simultaneous use of all video cards, as well as central processors in the system. It is possible to work if several video cards or video adapters of different manufacturers are installed (for example, AMD and NVIDIA). Hashcat is a command-line utility. So it does not have a graphical interface in the form of a familiar window. Therefore, Windows users may think that the program is launched in an unusual way. Then you can act in two ways. The first option: you can just drag-n-drop the executable file into the command window. The executable file is hashcat64.exe or hashcat32.exe depending on your system. As you can see from the screenshot, the folder C:\WINDOWS\system32 is changed to C:\Users\Alex\Downloads\hashcat-4.1.0. Since we did not enter any options, nothing happens, only a brief hint is displayed. The site has hashcat binaries and hashcat sources. The first is binary (executable) files, the second is the source code. We need binaries, i.e. hashcat binaries. Hashcat does not require installation, since it is a portable program. It is enough to unpack the downloaded archive. If you have problems with unpacking the .7z format, then use the program 7-Zip (archiver with a high compression ratio). To run hashcat, it is necessary that the latest drivers for video cards are installed. 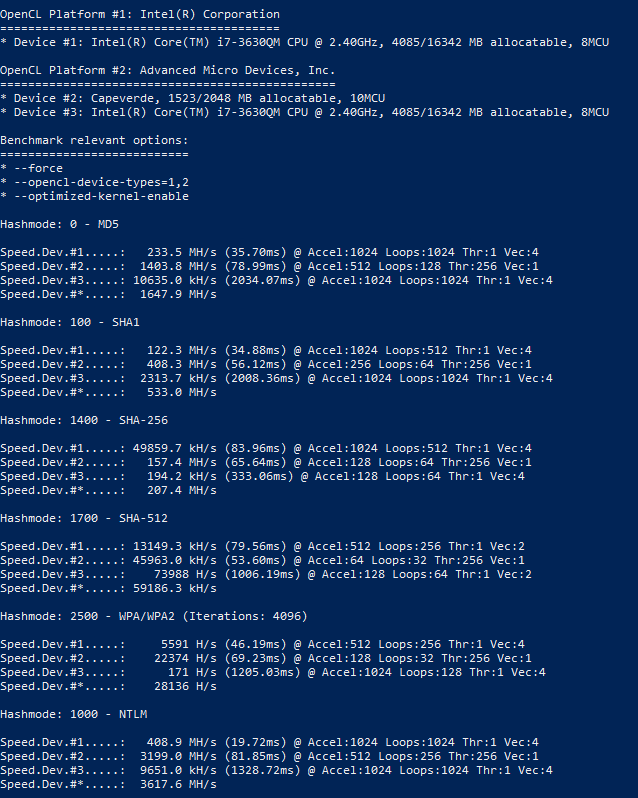 Most likely, drivers for AMD and NVIDIA graphics cards in Windows are already installed, or you know how to do it. Therefore, I will only talk about OpenCL Runtime and the OpenCL driver installation. OpenCL Runtime includes driver the Windows driver, so you only need to download one file with OpenCL Runtime for Intel Coree, Intel Xeon Processors for Windows, for example, the latest version is now: ‘OpenCL ™ Runtime 16.1.2 for Intel® Core ™ and Intel® Xeon® Processors for Windows (64-bit & 32-bit)’. Working with programs in the command-line interface is very different from working in the graphical user interface. In the GUI, we press different buttons, move switches, etc. This is not the case with programs with a command-line interface. But at the same time the command line utility can have even greater capabilities than a similar program with a window interface. In order to control the functionality of console utilities, options are used. In the output of the help you probably noticed a lot of information. This information is mostly devoted to the options. Options are specified after the file name separated by a space. Some options require specifying a certain value. Some are used without values ​​(such options are also called ‘flags’). Options can be used one at a time or several at a time. With the help of options you can very accurately configure the program, use it at maximum capacity. With one option we have already metб it is the -h option, which displays program help, then we'll get acquainted with even more options and their possible values. The next one is the -b option. 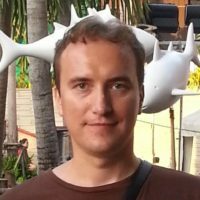 The -b option starts the hashcat benchmark. This benchmark measures the speed at which passwords are checked. Running the benchmark will be successful only if the drivers are installed correctly and everything is all right. Therefore, a benchmark is also a way to do a system and hashcat check. To stop prematurely, press CTRL+c. This shortcut stops all command-line utilities immediately. Remember this combination! Speed ​​is displayed for each device separately, as well as for all devices combined (line Speed.Dev.#*). * Device #3: Not a native Intel OpenCL runtime. Expect massive speed loss. The error says that it is not the native runtime environment of OpenCL that is used, and a significant speed loss is expected. For this reason, OpenCL devices will be skipped (in the screenshot below it is visible by the word ‘skipped’). If we want to use them anyway, we need to add the --force option. Pay attention to a very important point: an uppercase letter is used for the option. Options are case sensitive. An uppercase letter may have another, even completely different meaning than lowercase letter. To install the hashcat GUI, download the archive from the page to which the link above is linked. Hashcat you need to download separately, as shown above. Also you need to have the necessary drivers installed. 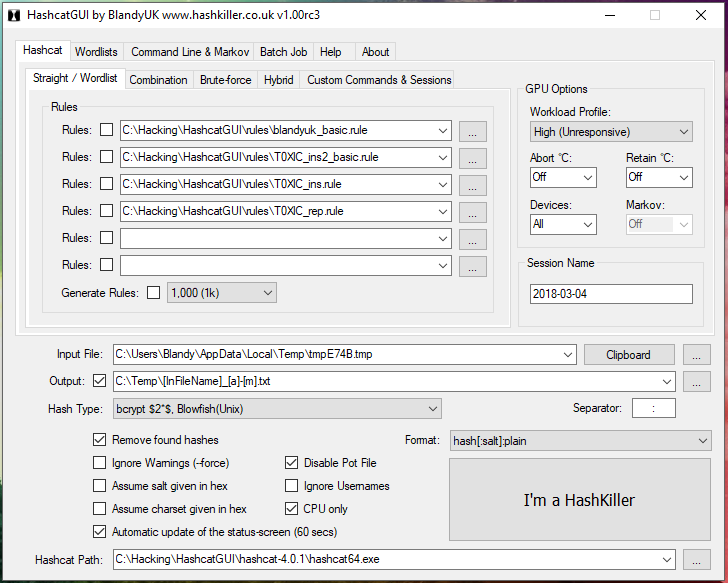 The folder with Hashcat-hashcat-4.1.0 is highlighted. Note that you do not need to rename the directory with a hashcat. In my opinion, it is complicated. In my subjective sense, it is easier to achieve the desired result in the command line than in the graphical interface, in which, by the way, some features are missing. Moreover, without understanding the concepts of Hashcat, it's unlikely that you will be able to do something even in the graphical interface. Therefore, continue reading this article, and we will return to the graphical interface later on the pages of the miloserdov.org web-site. Here hashcat is the name of the executable file, in my examples it is .\hashcat64.exe. Divided by the space, options follow the executable file. The symbol | (pipe) in this case means logical ‘OR’. 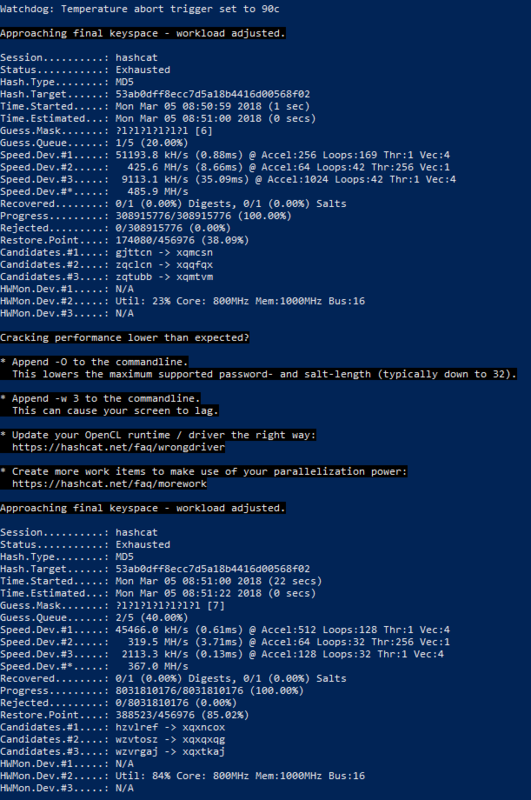 Therefore, hash, OR file with a hash, OR file hccapx file follows after the options. And then dictionary OR mask OR directory follows the hash, depending on the chosen attack. Consider the use of the program on specific examples. Suppose we have a hash of 53ab0dff8ecc7d5a18b4416d00568f02, which must be cracked. This hash is known to have been obtained with the MD5 hash algorithm (i.e. it is MD5 hash). It is also known that the encrypted string consists of only small letters of the English alphabet and has a length of six to ten characters. Next, we will show you how to launch a password attack using a variety of tricks. Different hashes are computed using different algorithms. Similarly, their cracking is performed using different algorithms. In order to correctly launch an attack in Hashcat, you must specify the type of attacked hash. To do this, use the -m option, after which you must specify a number corresponding to the selected hash type. Opposite the found hash, look at the column ‘#’, i.e. number. In this case, this number is ‘0’. So, to the Hashcat launch command, you need to add -m 0, it is the option and its value. If we were given a SHA1 hash, then its number would be 100 and to the Hashcat launch command we would add -m 100 and similarly for any other algorithm. Typically, a hash type is known from the source where this hash was obtained. In case the type of attacked hash is not known reliably, you can try to guess it with the help of specialized tools. Mask attack (brut-force), when candidates in passwords are generated based on the described criteria. Use the -a option to specify the attack mode. With it, you can specify any type of attack supported in Hashcat, the most popular is a dictionary attack which is indicated by the number 0, and a mask attack (brute force) which is indicated by the number 3. So if we run a dictionary attack, then we specify -a 0, and if we run mask attack, then we specify -a 3. Note: By the way, with Hashcat comes with an example of a dictionary, it's called example.dict. dictionary.txt is a path to the dictionary file. 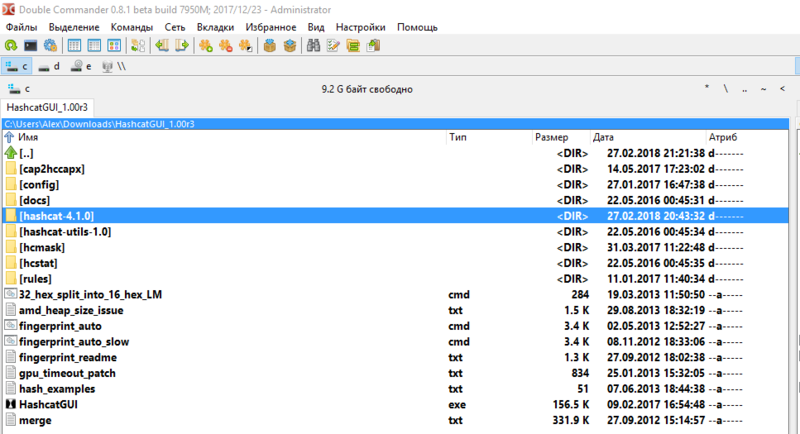 The first line is 53ab0dff8ecc7d5a18b4416d00568f02: hackware contains the attacked hash and after the colon the hacked password, in this case it is hackware. Hash does not need to be specified in the command line, it can be written to a file, then when the attack is launched, the path to the file containing the hash is specified. For example, create a hashmd5.txt file and copy into it 53ab0dff8ecc7d5a18b4416d00568f02. The command contains the same options as the previous one, but instead of directly hash, we specified the path to the file containing the hash to crack. 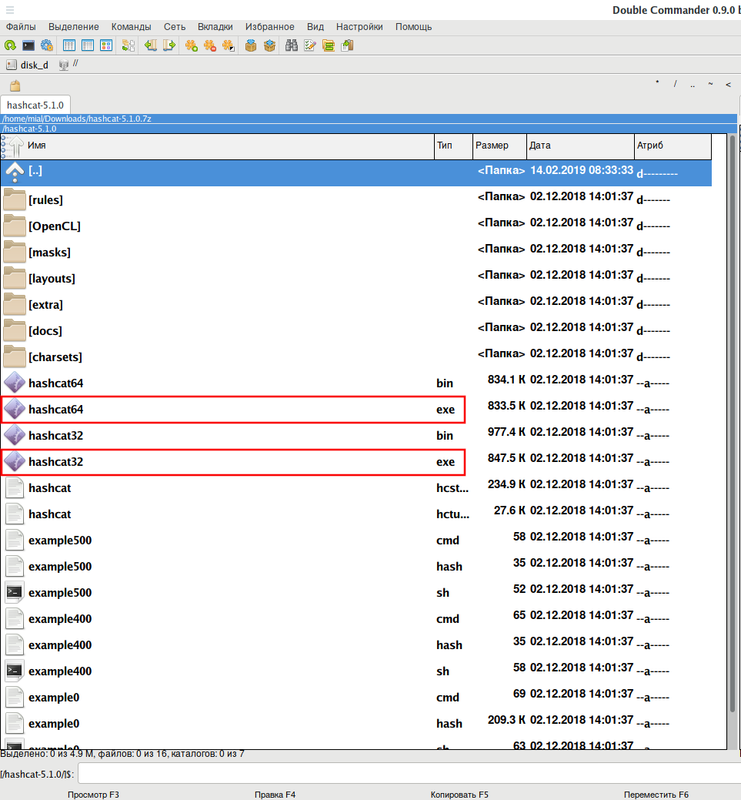 This file can be deleted to start attack anew on the same hash in different ways. and if it is found in the hashcat.potfile file, then information about the cracked password will be displayed. In Hashcat there is no such mode as brut-force. He was assimilated by the mask attack. This is a more flexible type of attack, which allows you to implement brut-force through finely tuned criteria. Therefore, it is similar to the previous one, but instead of the dictionary a mask is indicated. Let's begin our acquaintance with the built-in charsets, for many cases, they are enough. The first column denotes a symbolic symbol set. For use in masks, a question mark must be placed before this designation. For example, ?u means all uppercase letters, ?d means all digits. ?l?l?l?l?l?l?l?l is a mask that specifies the generation of eight-character passwords consisting of small letters. That is, 15724838912 variants of passwords from 208827064576 of the total number of variants were tested. The password length is not always known exactly. Even by the condition of our task, the password has a length of six to ten characters. The -i option is optional. If it is used, it means that the length of candidates for passwords should not be fixed, it should increase by the number of characters. The --increment-min option is also optional. It determines the minimum length of candidates for passwords. If the -i option is used, the --increment-min value is 1 by default. And the --increment-max option is optional. It determines the maximum length of candidates for passwords. If the -i option is specified, but the --increment-max option is omitted, then its default value is the mask length. the length of the mask can be larger in the number of characters or equal to the number of characters specified by the --increment-max option, but the mask length can not be less than the character length set by --increment-max. And also the mask length is increased to 10 characters: ?l?l?l?l?l?l?l?l?l?l (as required by the rules for using increment options). It means that all the password candidates was tested, but none proved true. Known symbols can be placed anywhere in the mask: in the beginning, in the middle, in the end; these can be single characters or groups of characters. Above, already listed are built-in character sets, which are usually enough. However, you can specify up to four of your own custom sets. Suppose we know that the first three characters in the password are digits, and not all, but only numbers from 0 to 4, the fourth character is only uppercase letters, and the fifth and sixth characters are the letters from a to h, as well as the numbers from 5 up to 9. If in the mask for the first three characters we just indicate the numbers, then obviously not suitable candidates for passwords (containing in the first three positions the numbers that are not in the range from 0 to 4) will be also tested. We must exclude obviously inappropriate passwords. This can be done using custom character sets. There are four user-defined character sets in total. They are specified in options and denoted by numbers. But in the options, a hyphen is placed before the digit (for example, the first user set is -1), and a question mark is placed in the mask before the digit (for example, the use of symbols from the first user set is ?1). So, to solve the problem, we start by setting the required number of user sets in the options. These sets can consist of directly listed characters, you can also use built-in character sets, for example ?l or ?d or ?u (in any combination). Let me remind you - custom character sets are written among the options (before the mask and before the hash). We will disassemble the mask:- the first three characters are designated as ?1?1?1 (these are units, and not a lowercase letter L, they are digits ‘1’) are symbols from the first user set. Next goes ?u, this is a built-in character set, denoting only capital letters. The next two characters are designated as ?2?2, these are symbols from the second user set. denotes the first user set consisting only of large and small Latin letters. means the first user set consisting only of large and small Latin letters, as well as numbers. As already shown above, you can use custom and built-in character sets in any combination in the mask. After creating complex masks, especially with the use of custom character sets, we would like to check whether we did everything correctly. Also, thanks to the flexibility of the Hashcat syntax, it is convenient to use it for generating dictionaries by any criteria. In order to only show passwords without starting cracking, the --stdout option is used. This option requires -a 3 (masd attack mode). 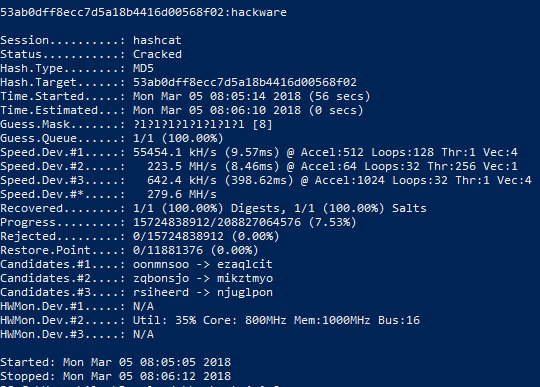 Since cracking does not start in this case, you do not need to specify any hashes. The Hashcat program includes not only help, but also hash examples. They can be useful if you have difficulty in correctly writing the hash format. I have downloaded and extracted the files twice through 7zip there is isn’t a single .exe file in there? how do i find it? good instruct, helpful, good job, thanks. Can I get the article as a reference source? I will write the author and source to this link. Very good instruction and its useful for me. thanks you very much for your manual.